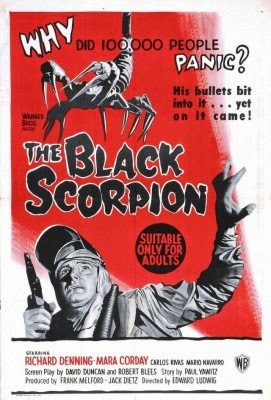 Rupert Pupkin Speaks: Warner Archive Grab Bag - THE BLACK SCORPION and RATBOY ""
Though I have come to enjoy the way that older films run all their credits at the front in big blocks, it does often serve to not allow enough emphasis on certain key contributors. For instance here Willis O'Brien is listed as the supervisor of special effects, but blink and you'll miss it. The great Willis O'Brien, who worked on the original KING KONG as well as mentored/inspired the great Ray Harryhausen! Dude deserves his own credit that's not part of a huge page of other credits at the front. Anyway, as you might guess, having Willis O'Brien on this movie is part of what helps make it a good time. The scorpion creature is lovingly animated in this movie and is given much frightening personality via many drooling-fanged closeups. There is a wonderful fluidity to O'Brien's stop-motion work here and it really makes THE BLACK SCORPION and standout monster picture from the era. 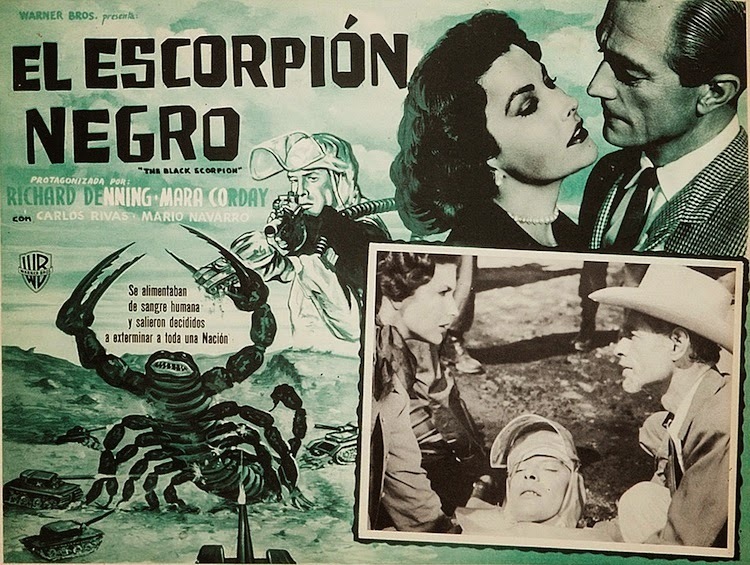 As much as folks seem to recall lots of the great monster movies of the 1950s, THE BLACK SCORPION gets talked about a little less than some of them. I adore THEM! and am also a fan of stuff like THE BEAST FROM 20,000 FATHOMS, and TARANTULA and THE BLACK SCORPION is right in that wheelhouse. There's just something so perfectly soothing for me about sitting back with one of these old movies on a Sunday afternoon. I think it may be a similar thing to what a lot of guys get from watching golf on the weekend (which I find frightfully dull). These are well-made movies and it's easy for me to see why they have not only stood the test of time, but also inspired many people who saw them as kids to go into special effects filmmaking. This disc is part of Warner Archive's "New to Widescreen" series and it is nice to see it in it's proper aspect ratio. -"Stop-Motion Masters" (4 Mins) This is a short interview with Ray Harryhausen, who talks about seeing KING KONG for the first time and how it inspired him to want to get into the field of animation. He talks about reading about how the film was made in Look Magazine and how he met Willis O'Brien for the first time and how he worked with him on some movies. -"The Animal World" (12 mins) This was a 1956 documentary by Irwin Allen, who hired Harryhausen and Willis O'Brien to do a "Prehistoric Sequence" for the movie. This 12 minute section is that sequence, with a short introduction by Harryhausen, who gives some background on it. -"Las Vegas Monster and Beetlemen Test footage" (5 mins) Test footage shot by Pete Petersen (who had previously worked with Willis O'Brien and Harryhausen on MIGHTY JOE YOUNG). These two sequences were apparently shot in Petersen's home studio in the late 1950s. -A Trailer gallery including THE BEAST FROM 20,000 FATHOMS, THE BLACK SCORPION, THE VALLEY OF GWANGI and CLASH OF THE TITANS. Why would I tie this film in with THE BLACK SCORPION? It's a tenuous connection, but I went with a special effects theme. 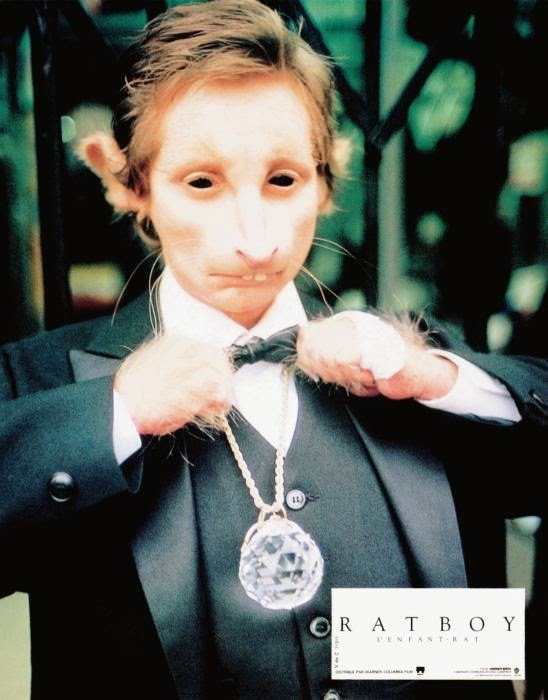 Since Rick Baker designed the makeup in RATBOY (and it looks quite good), I thought that maybe the two films could be mentioned together. That and the fact that both films seem to have become cult items over the years. 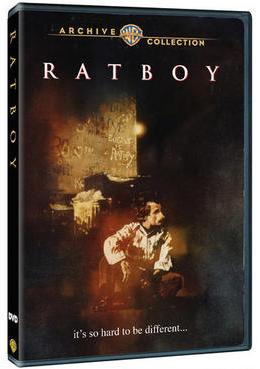 RATBOY's cult appeal is perhaps due to it's strangeness as a movie and a lack of availability on DVD until this release from Warner Archive. I know for a fact that I have an old VHS tape of this movie in my garage somewhere. It's one that wasn't common in the video stores of my youth, despite having been put out by Warner Brothers (their tapes were often found in our rental places). It's a tonally odd film and it was directed by longtime Clint Eastwood spouse (1975-1989) Sondra Locke. Locke also stars in the film as failed window dresser who tracks down the mythical "Ratboy" and makes several attempts to exploit his freakishness. It's very much a story in the vein of THE ELEPHANT MAN (the title almost seems like a play on that film's title), but with a bit more 1980s pizazz to it (perhaps to the movie's detriment). As with almost all tales of this type, RATBOY is a bit on the depressing side with some odd lighter moments sprinkled throughout. The supporting cast is quite interesting and contains the likes of Gerrit Graham, Louie Anderson, Tim Thomerson, Robert Townsend, John Witherspoon, Sydney Lassick, Larry Hankin, Billie Bird and Mr. Belvidere himself (Christopher Hewett). This remarkable ensemble might also be a contributing factor to the films potential as a cult item. Would make an intriguing(if not altogether compatible double feature with DEADLY EYES.